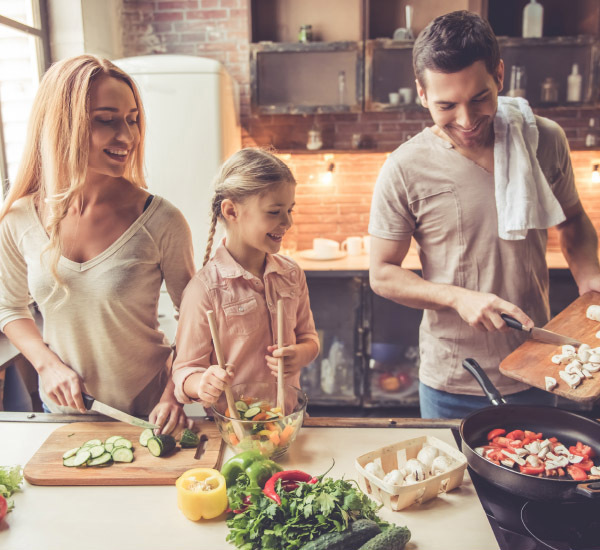 Eating together at home helps your family eat better, costs less than dining out and puts you in control of the quality and quantity of the food being served. It’s also a great way for your family to regroup and relax after a busy day. Use these tips to make more nutritious family meals happen. Set scheduled times for family meals on most days of the week. Make mealtime a device-free space to avoid distractions and allow conversation to flow. Plan meals for the week ahead and create a shopping list for ingredients you need. Save time by doing food prep like washing and cutting fruits and vegetables or cooking whole grains in advance. Stock up on healthy staples like whole-grain pasta and rice, canned and frozen fruits and vegetables, beans, pouch-packed tuna or salmon and rotisserie chicken that can be used to make a balanced meal in minutes.